A 10-minute walk from the bustle of Jerusalem's central bus station, Lifta's crumbling remains are a sanctuary of silence. 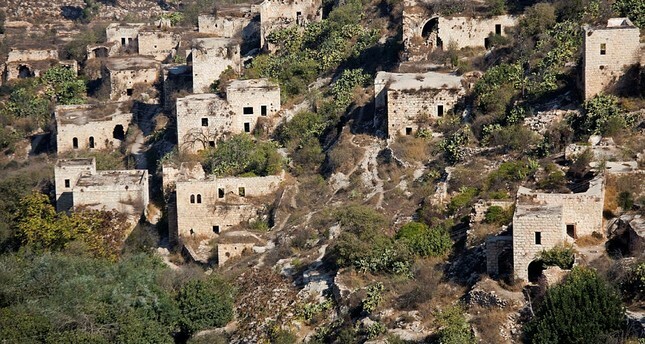 Residents of the former Palestinian village on the western edge of the city fled during the war surrounding Israel's occupation in 1948, and today it is one of the few depopulated Palestinian villages that was neither demolished nor re-inhabited. Now, the overgrown skeletons of buildings face a new threat: luxury apartments. Opponents want to preserve the town as an historic site. Until 1948, Lifta was an affluent Muslim Palestinian village of around 2,500 abutting the main road connecting Jerusalem and Tel Aviv. Fighting between Jewish and Palestinian militias took place in and around Lifta in December 1947, including an attack on a cafe that left seven dead, prompting its residents to flee, according to historical accounts. After the war, the village was incorporated into the state of Israel, and the residents were not allowed to return. Mohammed Abu Eleil, 78, grew up in Lifta, though his family moved elsewhere in Jerusalem a year before hostilities broke out. As he wandered through the remnants of his home village with his 55-year-old son Nasir on a recent day, he recalled the "peaceful and good life" in the Lifta of his childhood. "Nothing is more precious for the Arab man than his house," Abu Eleil said. "It is true that death is a disaster, but leaving or being expelled from your house is the biggest calamity for the Arab man." For reasons that remain unclear, Lifta was never demolished. After the war it briefly housed Jewish refugees, but most of its houses were abandoned again in the late 1960s. The roofs of the houses were blown open to prevent squatters from moving in. The village and its natural spring were later declared a nature reserve, and the rocky slope is covered in vegetation. Trees grow through some of the 55 remaining houses built before the 1948 war. But in 2011 a redevelopment plan was advanced to bulldoze the village ruins and the nature reserve— which today are part of one of the largest undeveloped tracts of land in the Jerusalem municipal area — into luxury residences, a hotel and shops. A group of Israeli and Palestinian activists, including descendants of the village's former inhabitants, pushed back against the plan, arguing Lifta should be preserved as a living monument. The Abu Eleils are involved with "Save Lifta," a coalition of Israeli and Palestinian environmentalists, political activists and researchers that has battled the development plan in Israeli courts for the past several years. Ilan Shtayer, the organization's coordinator, likened Lifta to Pompeii — "frozen in time." Former Lifta residents petitioned an Israeli court to halt the project, and in 2012 the court ordered the Israel Lands Authority to freeze the plan and carry out an extensive archaeological survey to map its historic remains. The survey was completed last December, and opponents of the development plan argue that the discovery of remains dating back thousands of years will force the state to scrap the project altogether. The Israel Lands Authority canceled a conference scheduled last Thursday to present the survey results. In a statement, the Lands Authority said the Lifta development plan would be advanced in the coming months, and that the plan would "place an emphasis on the preservation of antiquities in conjunction with the Jerusalem Municipality, the Israel Antiquities Authority and the relevant authorities." This month, the World Monuments Fund, a U.S.-based nonprofit working to conserve heritage sites around the globe, added Lifta to its watch list, warning that the redevelopment plan endangers the preservation of the site as "a rare place of heritage, recreation, and memory for the benefit of all citizens of Jerusalem." Shtayer envisions Lifta kept in stasis as "a memorial place to the catastrophe of '48, this catastrophe that is common to Israelis and Palestinians," a reference to the mass displacement of Palestinians as a result of the war and the decades of bloodshed that have continued on both sides since then. "Both of us 70 years after (are) still suffering from what happened here in '48, and Lifta is the only place around that can tell the story of what happened here, the civilization that happened here before, and to let us think about a different, better future," he said.